A week and a half ago I woke up at 6:00 am to the sound of a new email on my phone. I rolled over and groggily read the email that said that Allison had given birth to her baby boy earlier that morning. I smiled briefly at their immense joy and then rolled over and went back to sleep. 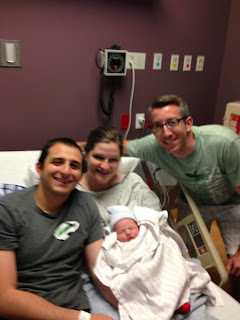 A few hours later I got a text from Kevin asking when I'd be coming to the hospital to see their new baby. I had some things to do in the morning and I said I'd head over as soon as I finished. On my drive over to the hospital I wondered what they had picked for his middle name. Months before they had chosen Levi as his first name and Kevin had expressed a desire to name him Levi Savage after one of his heroes from church history. I really liked that idea, too. I see Kevin and Allison every Sunday at dinner and I constantly voiced my approval of naming the unborn baby after Levi Savage since Savage would make such a rad middle name. Allison did not agree. They had also considered middle naming him after Kevin's dad or giving him Kevin's middle name. I already knew what his first and last name would be, but as far as I knew the middle name was still to be decided. I really don't like going to hospitals. As I walked by myself down the hallway of the labor and delivery ward I saw signs on all the doors that said, "Shh... Please be quiet. New moms and babies are sleeping." Definitely not the right place for someone as loud as me to be. I found their room and, remembering all the warnings on the doors, knocked super-quietly. I walked into their room and both Kevin and Allison looked as normal as ever and they seemed ridiculously calm and laid back for having become parents just seven hours prior. I asked them all the nitty gritty details about the birth and after being there for 15 minutes Allison asked if I wanted to know what middle name they had chosen for the baby. She said that they decided to name him Levi Benjamin. I replied, "WHAT?! REALLY?!" and Allison said, "Well, not if you're going to shout and wake up the baby!" They had decided to make Benjamin his middle name weeks before and waited until he was born to tell me. At first I thought it was really neat that Kevin and Allison had middle named their baby after me (I mean, I did introduce them after all), but as the day went on and I thought more about it I was stunned by the decision they had made. This was a really big deal! Both of their families have been so good to me, Kevin's in particular. My journal is riddled with comments about how much I appreciate Kevin's family and how much they mean to me. They include me in everything and have welcomed me into their family in an extraordinary way. And now I feel like we'll be connected forever. That night I opened up the Book of Mormon and read in Helaman 5 where Helaman explains to his sons Nephi and Lehi why he chose their names. He says, "I have given unto you the names of our first parents who came out of the land of Jerusalem; and this I have done that when you remember your names ye may remember them; and when ye remember them ye may remember their works..." I sat on my bed for quite some time wondering if Levi will ask Kevin and Allison about why he was middle named Benjamin and what they will tell him. I wondered how long I'll be an active part of his life and what he will know of my works and what I've done. And for the first time the idea of living in Tucson forever didn't sound like such a bad idea. Then I thought about what I would name my children and whose names I would trust them to bear. For the last year or so my two biggest heroes have been Elijah Abel and Jane Manning James. They were two of the earliest black members of the Church of Jesus Christ of Latter-day Saints and it is well worth the time it takes to read their biographical sketches on blacklds.org. Being a black person in antebellum America was incredibly rough and church members were not as Christlike to Elijah and Jane as they should have been. They faced persecution and were treated like second class citizens by some simply because of the color of their skin, but both of them stayed faithful to what they believed to be true to the end of their lives. They had what I consider to be legitimate reasons to leave the church, and yet they stayed. Both of them were very close to Joseph Smith's family and the way they were welcomed by the Smiths is truly remarkable. I love this sentiment expressed by Jane: "I try in my feeble way to set an example for all." If I had a son and a daughter I'd want them to be named Elijah and Jane to honor two people who I respect so much. I don't know what Kevin and Allison will tell Levi about me when he's older, but I imagine they'll tell him how they each met me and how they met each other through me. And I hope when he's old enough to understand they'll explain to him how their friend Benjamin is gay and despite what he considers to be legitimate reasons to leave the church, he chooses to stay. I will try in my feeble way to set an example for Levi Benjamin. I feel so incredibly honored to have a little baby in Tucson middle named after me. Aww, that's endearing. I read your most resent post and now I'm going to read till I konk out. I am so excited. You're a well versed writer. Love it. ..